I only have two bulky yarn hat patterns. I would be glad to convert either of these to flat knit patterns if you are interested. Heather I love this pattern and just finished my hat. I was wondering…would you consider writing the same pattern for some fingerless gloves to match this awesome hat? I haven’t tackled fingerless gloves. I will add this to my list. Thanks for the suggestion. this says for circular or double pointed needed. can it be done with just, i dont know what they are called im new to knitting, the regular needles? Thanks for catching that! I should have just said regular needles. When I adapted the pattern from my in-the-round version, I failed to remove that reference. thank you for clarifying this will be perfect match for the scarf im making for my daddy. havent seen him in 3 yrs since moving to europe, an wanted something special for this holiday. I love this pattern! I am looking to make this and a matching scarf. Is this easy enough to just knit into a scarf and not in the round? Thank you for writing such a lovely pattern! Just make a little edging of seed or moss stitch and it will make a great scarf. I’m math impaired. What is the stitch repeat on this pattern? I’d like to make a scarf, too. It is a repeat of 14. I added 1 so that there would be an extra stitch for the seam on the hat. If you add a few stitches of moss or seed stitch at the edges of this, it would make a lovely scarf. I am not familiar with magic loop? 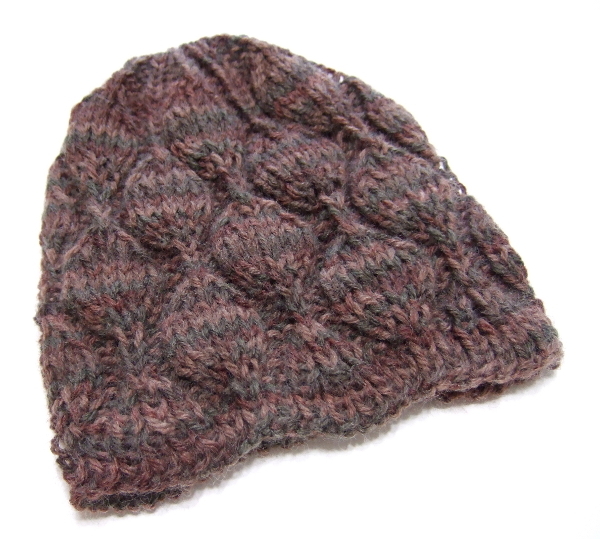 the hats i have done in the round have used 16″ circular needles. Can i do this pattern on the 16″ needle? Thanks! I’m sorry it’s taken me so long to respond. The version of this hat that you’ve commented on is the straight needle version which is not done in the round so will have a seam. It can be made on a circular. The in-the-round version can be partially made on a 16″ needle, but once you begin the crown reductions it will get too tight. At that point you will have to either start working back and forth and seam the crown or transfer to some method of in-the-round for small circumferences, such as double pointed needles. I prefer the magic loop method personally, but there are several methods that are documented on the internet for doing it. Thank you so much for this and all the other patterns you have for free. I just started this hat and although I am able to knit in the round I prefer knitting flat and seaming. To give the option of flat or in the round is great. Thanks again. Thank you for providing this lovely pattern! I really enjoyed knitting it, it has a nice balance of easy rows along with rows that are trickier but fun to do. The 3-D outcome is beautiful! I am having a lot of trouble with row 7, I always end up halfway through the pattern at the end of the needle. Can you help? Absolutely. How many stitches did you cast on? Do you still have that same number of stitches after row 6? To what stitch do you get on the pattern before you run out of stitches to work? I have double knitting wool, can I use 4mm needles with the amount of stitches for a large adult for a medium adult size hat. Cast on for the extra large to get the medium size.